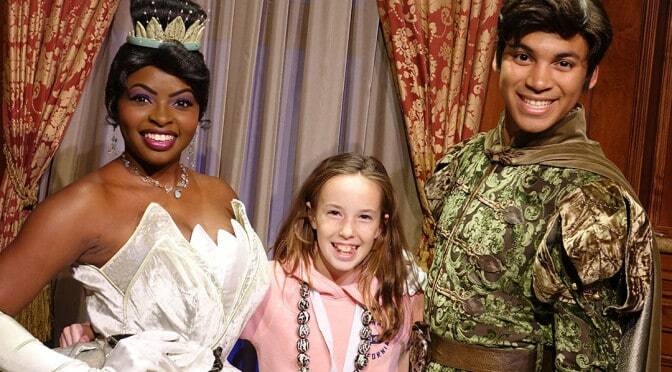 Tiana and Prince Naveen are set to provide a new Ice Cream Social experience that will involve the Liberty Square Riverboat and a “special” viewing of the Festival of Fantasy Parade. Guests who take part in this Ice Cream Social with Tiana and Prince Naveen (in winter) will be “reserved viewing of one of our grandest processions.” Let me state that I have made the ride upon the Riverboat during a parade and you can’t see hardly anything! You’ll mostly see trees and the heads of characters blocked by those viewing from ground level. You’re also very far away from the parade. If you wish to pay the upcharge for the event in order to meet Prince Naveen, that’s your choice, but if you’re doing if for a great view of the parade, you will be dissapointed. Guests will receive a commemorative autograph card. Dates are currently only going until March. Any idea if they are extending into April and May? We went to the party today and it was a lot better than I was expecting. You were able to get ice cream and desserts on the landing and get your picture with Tiana and Naveen. Once everyone was on the boat the royal couple came on briefly then left before the parade started. The boat pulled up a little bit to watch the parade and as soon as the last float left our viewing area the boat went backwards to the landing to pick Tiana and Naveen back up. They stayed on the boat the entire time. They did a parade with the kids on the boat and were available for as many pictures as you wanted. On the boat they had more snacks and cast members kept walking around with baskets of snacks to offer. The view of the parade was better than I was thinking but overall it was a fun thing to do. Interested in sharing a full review with photos? I noticed you said prince naveen will be there (in winter). We are planning on going in May. Will he be present then? It’s pretty confusing. I’m thinking you eat ice cream on dock, watch parade (bad view) return to dock and meet Tiana and Naveen briefly. I think you rock, Kenny. Thank you for all of the information you give us, but especially for your honest opinions. As I was reading your article, I was thinking, “how can you see the parade from the riverboat?” You seem to be a good man who is true my interested in giving us the best advice ever. I, for one, appreciate it. If they offer something of value or a great unique experience, I would be the first to register, but I guess this appeases those who haven’t met Naveen and are willing to pay more than the cost of a character meal to see him.